Following Tura New Music’s annual northern route across Northern Australia and down its West Coast travelling to capital cities, regional centres and remote communities, the Crossing Roper Bar Tour 2013 travels from Darwin to Kununurra, One Arm Point, Djarindjin/Lombadina, Beagle Bay, Broome, Karratha, Roebourne, Exmouth and Perth. Tura joins with the Australian Art Orchestra to present this cross-cultural journey bringing the city to remote Australia and remote Australia to the cities. 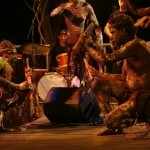 Performances in concert halls to concerts in exotic remote locations, the tour weaves a rich tapestry of an ever evolving program of uniquely Australian musics.